Basic Open Front Elevated Toilet Seat from Maddak elevates the seat by 3” and has a 350 lbs capacity. It is solid and comfortable as a regular toilet seat, just higher. 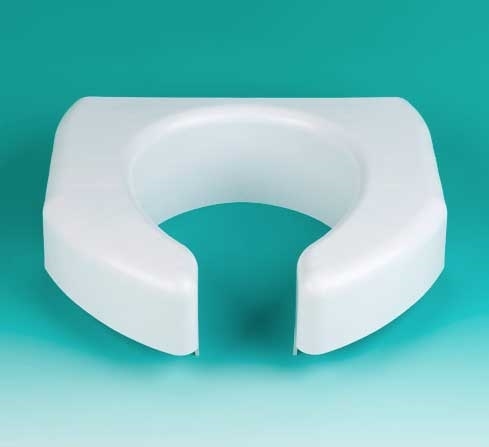 It is a basic donut style toilet seat riser that fits most standard and elongated toilets. The Basic Open Front Elevated Toilet Seat has an open front for easy access for hygienic purposes. It is raised toilet seat that is easy to install and requires no tools. It is made from durable plastic and won’t chip or rust. They are designed to last for years. It elevates the seat by 3”. The actual measurements for this seat are 16.125” x 14.4375” x 4.5”.